Hillsboro senior Lana Grover secures a defensive rebound on Monday at Hillsboro High School where the Lady Indians hosted the Lady Blue Lions of Washington Court House. McKenzie Cosby of Hillsboro attempts a shot against Washington’s Hannah Haithcock on Monday at Hillsboro High School where the teams engaged in a FAC varsity girls basketball contest. Hillsboro’s Lady Indians hosted the Washington Lady Blue Lions on Monday in a game that was originally scheduled for Saturday but was delayed by winter weather and poor road conditions in both Fayette and Highland counties. 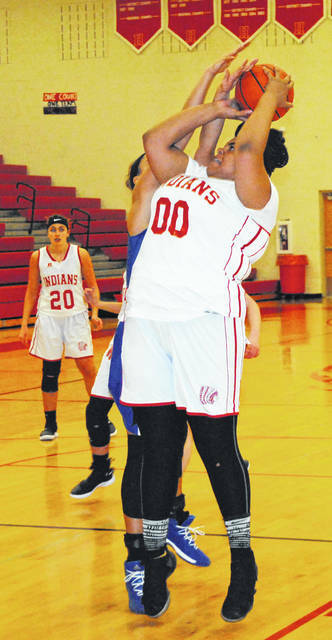 Both teams showed signs of a layoff as the Lady Indians pushed Washington further than expected in the 46-33 loss. 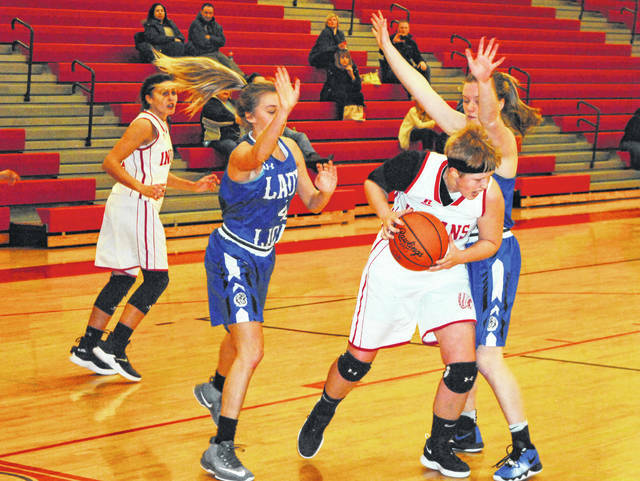 The Lady Blue Lions swept the season series with the win combined with a win on November 26, 2018 at Washington High School where the Lady Indians fell by a score of 61-26. Washington opened the game with an 11-0 run that stretched until the 1:48 mark of the first quarter that was capped by a three pointer by Hannah Haithcock. Despite the opening run it was clear that the Lady Blue Lions were feeling the extra time off as they committed several uncharacteristic turnovers that limited the team’s fast break points. Kayden Watson recorded the first basket of the game for Hillsboro at the 1:48 mark of the first quarter and Lana Grover added a three pointer a short time later to bring the score to 11-5. Rayana Burns was fouled with 39.6 seconds to play in the quarter and hit the first free throw but missed the second which was rebounded by Haithcock and put back in to provide the final points of the first and give Washington a 14-5 lead as the teams prepared for the second quarter. Washington opened the second quarter with a six to nothing run over the first two minutes to take a 20-5 lead and force the Lady Indians to call timeout with 6:05 to play in the first half. Hillsboro’s ladies responded admirably with an incredible 6:05 defensive stand as they held the Lady Blue Lions scoreless for the remainder of the second quarter. During the dry stretch for Washington the Lady Indians took advantage as Karleigh Hopkins scored three points and Watson added a steal and fast break layup to bring the score to 20-10 at halftime. Hillsboro continued their strong defensive play in the third quarter and outscored Washington 11-10 in the third quarter as they tried to claw their way back into the game. Jordan Moberly had four points to lead Hillsboro in the third while Gracie Dean and Josie Hopkins each had two for the Lady Indians. Watson capped the quarter with a three pointer to get Hillboro within nine points heading into the fourth. Washington found a rhythm at the free throw line in the fourth as Haithcock and Shawna Conger combined to go six for six at the charity stripe to start the quarter as the Lady Blue Lions pushed their lead to 13 points with the scoreboard reading 23-36. Halli Wall and Aaralyne Estep each hit consecutive buckets around a split pair of free throws for Hopkins to extend Washington’s lead to 40-24 essentially sealing the game for the Lady Blue Lions. Both teams will take the floor again on Wednesday with the Lady Indians hosting the Lady Ironmen of Jackson in FAC play and the Lady Blue Lions traveling to Chillicothe to take on FAC foes the Lady Cavaliers.